Rockstar Energy Husqvarna factory rider Pela Renet on Saturday achieved two personal goals. After two weeks and almost 9,000 km through South America he arrived safely at the Dakar Rally 2017 finish line in Buenos Aires and in a top ten position. Renet was overall seventh at the end of the world’s toughest annual rally. British rider Sam Sunderland was the overall winner on Saturday while his Austrian teammate Matthias Walkner took second. Gerard Farres Guell of Spain completed the 2017 podium. Renet was competing in his second edition after having been forced out with an injury last year. Over the two weeks of competition he grew in confidence and this was reflected in his string of top 10 stage results. It was clear from the first week that the French rider, who came to rally last season from world enduro racing, was in the ascendency. As early as the second day he took third place in the stage and moved into the top 10. Adopting a policy of cautious but consistent riding, he was fourth in stages three and ten and climbed to sixth overall with two stages to go. Renet was left to be Rockstar Energy Husqvarna’s standard-bearer after his teammate Pablo Quintanilla of Chile went out injured in stage ten, so close to the finish and riding in second overall. Quintanilla sustained a slight concussion in a crash and suffering dizzy spells, was unable to continue. Fortunately he had no other serious injuries. He finished third in the 2016 edition, which was the first contested by the then newly formed factory team. 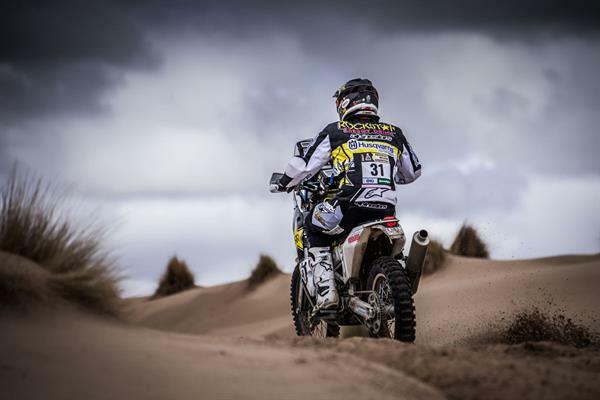 Quintanilla returned home to Chile after the crash and is committed to being fit to defend his 2016 FIM Cross Country Rallies Championship title in the 2017 season. The 2017 Dakar Rally started in Paraguay and continued to Bolivia, where riders had to contend with almost a week of high altitude riding and had their first taste of extreme weather conditions that were to disrupt the program and result in the cancelation of two stages and the shortening of another two. They rode in temperatures from the 40 degrees Celsius to freezing and along the way encountered torrential rains and flooding, especially in the second week. This edition offered a remarkable range of terrain and conditions and also new features in navigation, all this added layers of difficulty for competitors.